Dance devised by Mylène Rousseau, on behalf of the RSCDS Paris Branch, for the 25th Wedding Anniversary of Danielle and Jerry Reinstein and introduced at their Anniversary Dance held in Paris on 23rd June 2012. This dance has been revised on 2017 (last 8 bars of the reel). 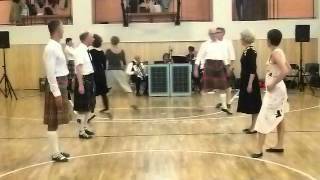 Added on: Aug. 23, 2012, 6:24 p.m.
Oldenburg 2017-09-25 2017-09-25 Martin McWilliam March 4, 2018, 7:33 p.m.
Advanced Dancing 2019-03-04 Ann Murray March 4, 2019, 10:06 p.m.